The temple is located 25 miles from Kumbakonam & 15 miles from Thiruchaerai. The Moolavar is Bakthavatsala Perumal, Batharaavi Perumal seen in standing posture facing east. The speciality in the temple is the daily pooja to a bees nest like structure in the Thaayaar's sannadhi. It is also known as Lakshmivanam for Goddess Lakshmi is said to have done tapas here. 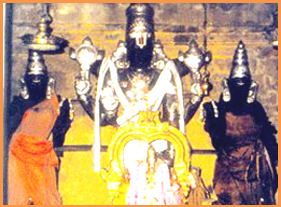 Lord Siva in four forms guards the Kshetram from four sides. Access to the temple About 4 miles from Thiruvaroor Station. Features There was found a bee-hive in the sanctum sanctorum of the Goddess for many years but not now. The Moolavar of this kshetram is Bakthavatsala Permal. He also known as Bhaktaraavi perumal. The Moolavar is giving his seva in standing posture with his face facing the east. Prathyaksham for Lord Varuna and Romasa Munivar. This temple lies in the Tanjore district of Tamil Nadu. It is about 25 kms from Kumbakonam, 15 kms from Thirucherai and 4 kms Northwest from Thiruvarur Railway station. But facility and facility to stay are also available.